I get so sick of the same old veggies at dinner time. We will have peas, broccoli, green beans…over and over again until I want to scream. So I decided instead of screaming I would change it up!! 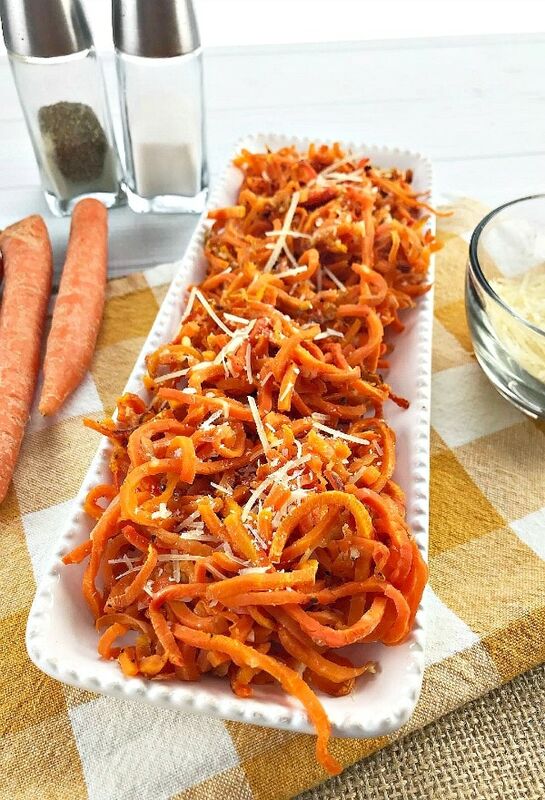 These Parmesan garlic roasted carrot spirals were perfect for a change. I never cared for carrots as a child, but they have really grown on me as an adult. I love roasted sausage and veggies and carrots are always in the pan. It is nice to experiment with different recipes for veggies so we don't get sick of eating them. I need all the help I can get to eat more veggies! First preheat the oven to 400 degrees F.
Spiralize the carrots. I like to use my Ninja Intelli-Sense Kitchen System with Auto-Spiralizer . It is AWESOME at spiralizing veggies. You can check out a video demo I made HERE. 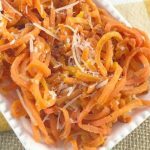 Toss the carrots spirals into a medium size bowl and add in the minced garlic , onion powder and 1/4 cup Parmesan cheese . Add salt & pepper to taste preferences. Place the carrots on a baking stone or cookie sheet. I like to use a stoneware bar pan . It seems to make the veggies roast evenly and perfectly. If you want to spray the pan with nonstick cooking spray you can. Remove from the oven and garnish with Parmesan. 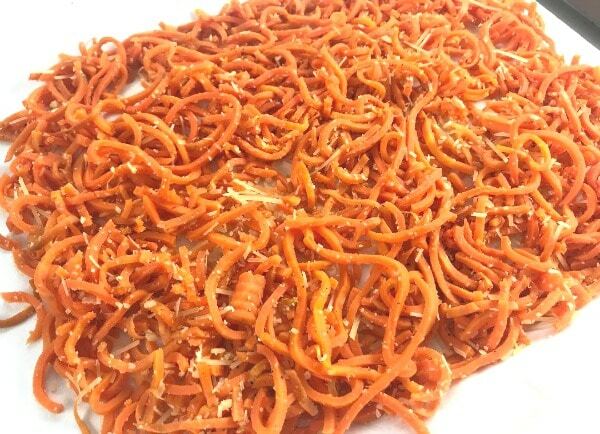 I think these roasted carrot spirals are perfect for holiday meals. They just look so pretty on a platter. It is the perfect healthy side dish to help you stay on track if you are trying to lose weight. If you are following the Weight Watchers program this is a great side dish option. The whole recipe has 3 Freestyle SmartPoints. If you divide it into 4 servings it will be 1 Freestyle SmartPoint per serving. It is hard to say exactly how much each serving size will be due to the carrots being different sizes. The only thing that has points is the Parmesan cheese. So it really doesn't matter that much…just realize there are 3 points total if you eat the whole plate of carrots, LOL. I have a whole bunch of carrot recipes gathered up. Eating carrots the same way all of the time was getting old so I searched and found a lot of ideas for different ways to cook carrots! If you want some SWEET carrot recipes check these out! 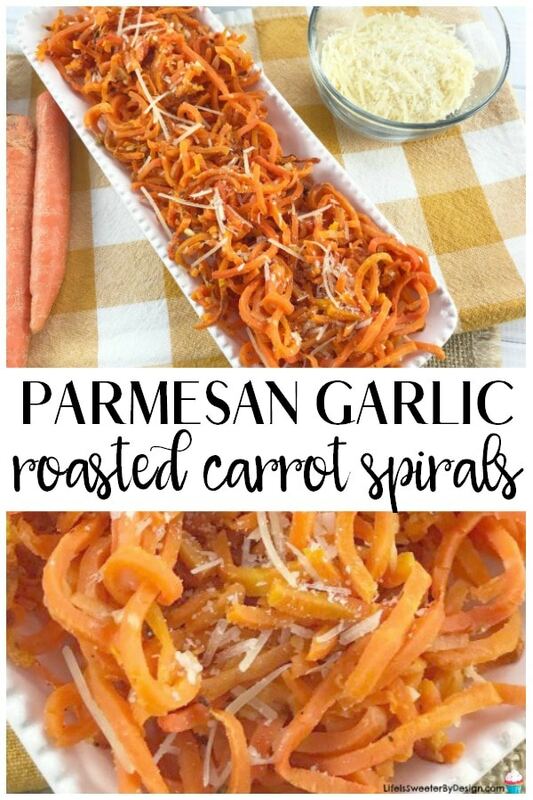 Let me know how you like these Parmesan Garlic Roasted Carrot Spirals! I know your kids will have fun eating the spirals…mine sure do. 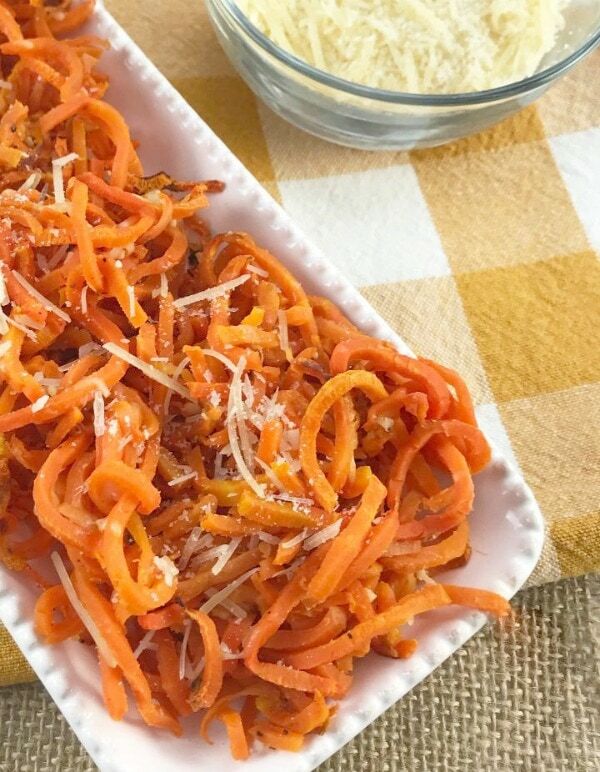 Parmesan Garlic Roasted Carrot Spirals are a fun way to eat your veggies. This easy side dish looks great on the table too! 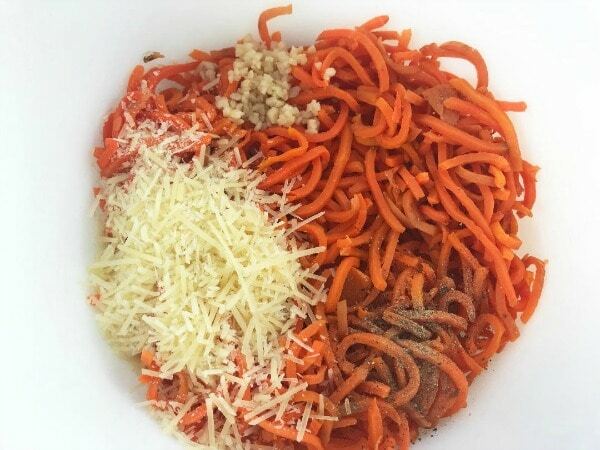 Toss the carrots spirals into a medium size bowl and add in the minced garlic, onion powder and 1/4 C. Parmesan cheese. Add salt & pepper. Place carrots on a baking pan. You can spray the pan with nonstick cooking spray if desired. Bake for 15-20 minutes or until the carrots are tender and crisp.